Change connections in record time with complete ease. Rubber grips reduce likelihood of scratching. The Brass Quick Connector Set makes switching connecting and disconnecting hoses and tools fast and easy. The kit includes a male end and a female end that fit are machined to fit together perfectly. Simply pull the snap-ring back, insert the pieces together, and release. It's that simple. The Brass Connector Set allows you to form a water-tight seal in seconds, with just one hand! You can use the Brass Quick Connector Set to attach and remove your hose quickly from the spigot or connect two hoses together. Many professional detailers and enthusiasts use the Brass Quick Connector Set to quickly switch between tools including foam guns and fireman nozzles. 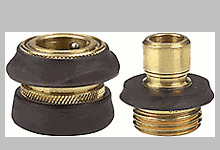 The Brass Quick Connector Set is made from solid brass. It features rubber grips around the circumference that greatly reduce the risk of scratching should the connector accidentally contact your paint. This is a rugged piece, built for a long-life with high usage. A must have to save time. Stop screwing around and use a quick connect. This product will save you time and aggravation. ProsGreat quality. Will last for years. I am a concrete mixer driver and this little item makes life and my job easier for me. It makes things so easy to keep clean in regards to the water nozzle and also by the unit able to swivel my hose does not get bound up! ProsI see that this product is made by Gilmour so that explains why the quality is the way it is.